Boston, January 24, 1917. Mary Creed, 14 years old. 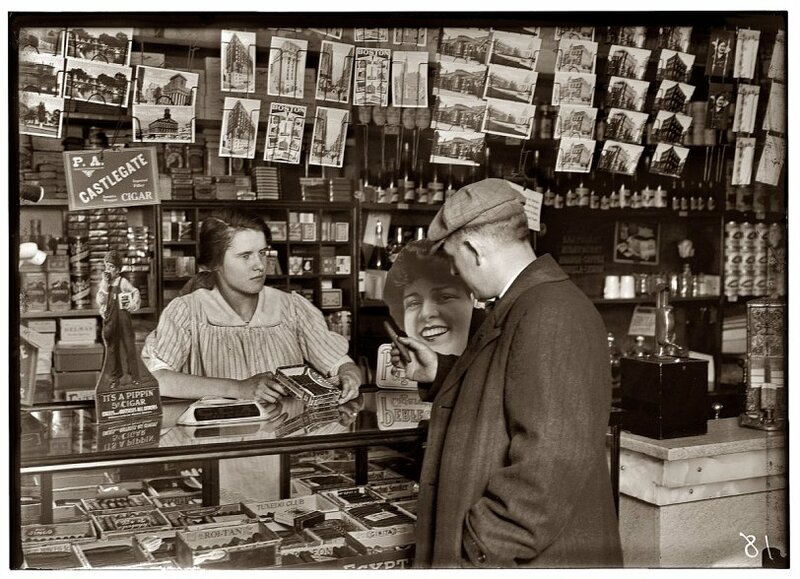 Selling cigars in store of Mrs. Breslin, 817 Harrison Avenue. View full size. Photo by Lewis Wickes Hine. Submitted by gimelgort on Sun, 01/13/2013 - 9:34pm. Man to man, smoke a Roi-Tan cigar! Man to man, smoke a Roi-Tan! For a taste that is better, by far. Why is this in my head? I'm only 54. Was it a TV commercial? Submitted by Chuck E. Luv on Sun, 07/29/2007 - 9:14am. Thomas Riley Marshall (Vice President of the United States from 1913 to 1921) said, "What this country needs is a really good five-cent cigar." It looks like there were plenty to choose from in 1917! Roi-Tan is a brand that’s still available today.